The officers of the Department of Pensions pledge to dedicate their best to inherit a drug free country for the future generation with the intention to make the all Sri Lankans a higher nation free form drugs at the department premises on 03.04.2019 parallel to the Bakmaha Diwuruma- National Drugs Eradication Programme, implemented accordingly the sustainable development concept of the President of the Democratic Socialist Republic of Sri Lanka, His Excellency Maithripala Sirisena to establish a drug free country. More than 50% from socio-cultural and economic crises can be prevented through a national drug prevention policy and the Director General of Pensions addressed the department officers with a short speech emphasizing the importance of assisting the drug eradication operation implemented as per the decisions taken by the His Excellency the President as the head of the state and Prime Minister including the cabinet. The Director General of Pensions stated the use and trade of poisonous drugs is banned according to the Buddhism and all should be dedicated on behalf of the drug eradication national policy as one nation irrespective to their religion and races, not limiting the Bakmaha Diwuruma for the minute it taken the pledge. Further, the officials were requested to provide the information of drug dealers who made the nation a pray to the institutes the government is regularly informed by the media if any. The short event was concluded after singing the theme song of the drug eradication program. The Department of Pensions cricket team was able to mark a landslide victory winning all the matches participated at the Friendship Cricket Match Tournament organized with the purpose to strengthen the good will among the institutions of public service by Department of Pensions on 30th March 2019. 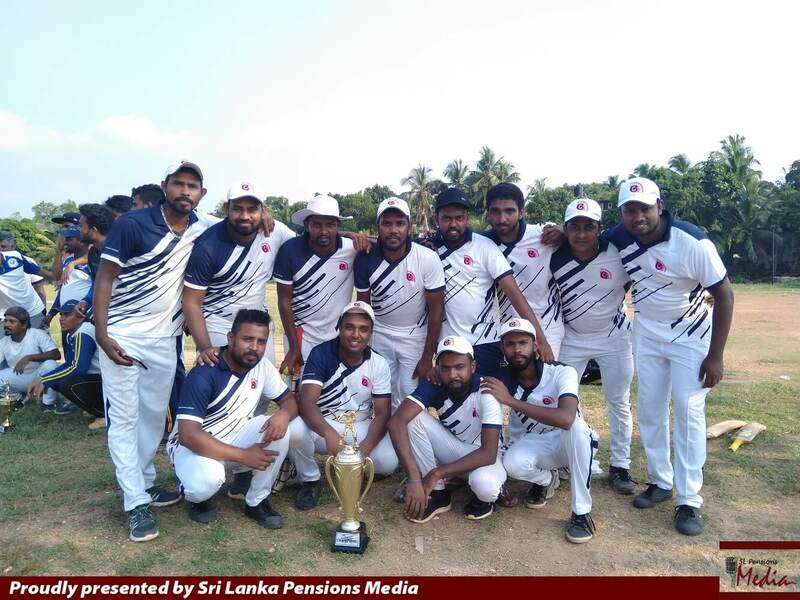 The Department of Pensions, Ministry of Fisheries and Aquatic Resources and Election Secretariat Office were took part for the Friendship Cricket Match Tournament held at Janaka Suriya Bandara Ground at Ragama. Each series was consisted with 08 overs and the first match of the tournament was held between the Department of Pensions and Election Secretariat Office. The Department of Pensions team reached to the finals with the decisive victory marked at the above match, to battle with Ministry of Fisheries and Aquatic Resources cricket team. The championship was won by the Department of Pensions by two wickets. Shiron Madushanka won the award of Player of the Match scoring 115 with maiden fifty (65) launching a marvelous innings across the tournament while Mahesh Rathnayaka scored crucial 31 marks awarded as the Player of the Tournament. The runner up was won by the Election Secretariat. The meritorious programme of “Dharma Deshana” organized by the welfare society and staff of the Department of Pensions, parallel to the National Programme of Declaring Thripitaka as a World Heritage, was held on 22.03.2019 at the department premises. The Dharma Deshana was delivered by The Most Venerable Thero of Mahmewunawa Asapuwa, Kaduwela reminding the value of preserving the noble Thripitaka Dhamma as humble Buddhists. He further emphasized the sincere preparation to study the Thripitaka Dhamma deeply, parallel to the National Programme of Declaring this deep collection of Thripitaka Dhamma as a World Heritage being a nation who preserved the Thripitaka Dhamma transformed orally over generations by a Most Venerable Arahath Thero. The staff officers including Director General of Pensions, A. Jagath. D. Dias, Additional Director General of Pensions K. R. Pathmapriya, Director Rusitha Dharmasena participated for this meritorious programme.